For nonhazardous issues, call Allan Berry. The City of Fairview’s Stormwater Management Program manages drainage, improves water quality, and protects habitats by operating and maintaining the stormwater conveyance system, implementing design and construction standards, reducing the introduction of pollutants, and enhancing riparian areas. The Public Works Department has primary responsibility for the implementation of the stormwater program. 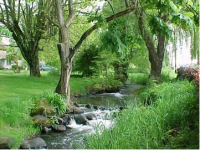 We construct, maintain, and improve the public drainage system to meet the needs of the public and to comply with water quality regulations set by the Oregon Department of Environmental Quality (DEQ). The majority of stormwater and surface water that flows from Fairview city limits discharges to Fairview Lake. Fairview Lake discharges to the Columbia Slough, which flows to the Willamette River. Because of these connections, Fairview is mandated to comply with applicable water quality requirements of the federal Clean Water Act as it pertains to these individual water bodies. The city has existing programs and policies that prevent and reduce water pollution through the use of best management practices (BMPs). The City’s 2011 Stormwater Management Plan (SWMP), modified in 2015, reduces pollutants from stormwater through street and stormwater maintenance activities, eliminating non-stormwater discharges, spill prevention and response, public education and participation.